The Wide World Magazine VoL xxxvii.—6. 1916. Courtesy of Public Archives of Nova Scotia, Halifax, N.S. Digitized by Doug Frizzle for Stillwoods.Blogspot.Ca, November 2017. Though it is one of the oldest parts of Canada and its coast has been settled for two hundred years, Nova Scotia to-day is among the least known and visited regions of the great Dominion. Its interior is still dense forest, railways and roads are few and far between, and there are practically no industries. In this article Mr. Amy describes a trip along the railwayless southern coast, through a sparsely-inhabited, wonderfully beautiful country, full of memories of an historic past, but now slumbering and decadent. That this veritable “Land of Sleep” exists in the twentieth century will come as a surprise even to many Canadians. FROM a high board fence a large weather-beaten sign, “Eastern Shore Coach,” broke in hopefully on sundry misgivings as to the small coastal steamer covering the first stage from Halifax eastward along the railwayless south coast of Nova Scotia. It suggested an unexpected and therefore doubly welcome alternative. To the Canadian mind it pictured a double-decked vehicle of the time of Dickens, with four horses, spectacular yards of flourishing whip in the hands of an expert driver, a winding horn, a boot, a guard, and other pleasantly-antiquated associations of our forefathers across the water. We made inquiries. The coach would leave the yard the next morning at six, the woman said. We could picture it—whip and horn and outside seats and all. We would coach, by all means. 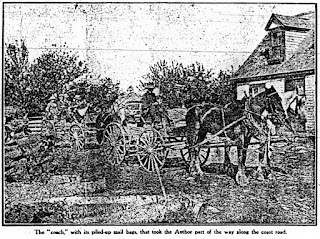 At six-fifteen, in the remnants of a night’s fog, two ordinary double-seated two-horsed light wagons crawled into the narrow streets. There was no whip, no horn, no guard, no choice of outside or inside seats. It was disappointing. Half an hour later we were on the ferry to Dartmouth, the unoccupied seats of both wagons piled with mail-bags. We were “coaching” for the first time in our lives. Ahead of us stretched a thousand miles of zigzag coastline, two hundred miles of winding road, leading through the oldest part of Canada, a coast with more than two centuries of active habitation to its credit, and still without a railway—unvisited, unknown, more sparsely peopled than a century ago, sleeping after generations of industry. The time was when Halifax was the symbol of British authority in North America, and the south-east coast was its recruiting-ground, sending thousands of hardy sailors to man the warships that warded off French aggression and American privateering. Most of the rest of Canada was unheard of and uncared for then. 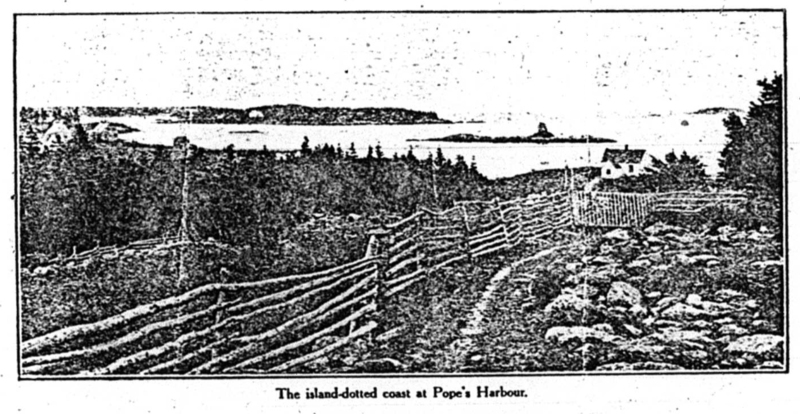 Now the scanty population of this strip of Nova Scotia coast sits back and listens hungrily to the tales of its sons who have deserted it for the “call of the West” or the cities that did not exist when it was in its prime. Our first goal, twenty-eight miles ahead, was Musquedoboit Harbour—a typical assortment of the alphabet discouraging the efforts of the novice and pronounced according to no rule known outside the locality. The French and the Indians were about when names had to be selected in this region, and the resultant compromise with the succeeding English demands experience for pronunciation. Chezzetcook, Petpeswick, Jeddore, Mushaboon, Necumteuch, Ecumsecum, Newdy Quoddy are samples of unconventionality calling for delicate treatment. We—the Woman-who-Worries and I—modestly exhibited a large Government map when making inquiries. It saved time and prevented confusion. That first score of miles presented us with a fair sample of the country ahead. It was a dreamland of solitude on the left hand—the north—with crowding bush, beautiful lakes, and ragged hills; on the south was a narrow fringe of fishing villages, with decrepit orchards round grass-grown ruins where stone houses had once stood. Everywhere there were glimpses of island-dotted ocean—and throughout the way bumps and rocks and uncontrolled streams and blazing sun. It was generally delightful, with sufficient physical consciousness to preclude, disinterested dozing—perhaps the ideal combination for the appreciative traveller. At “Fourteen and a Half Mile House” we changed horses. For two hundred miles the coach carries to the residents their tri-weekly mail, changing horses every fourteen miles or thereabouts at roadhouses that honourably admit such discrepancies in distance as half a mile. Simple honesty is in the atmosphere here, and the right kind of traveller sighs with satisfaction—except where the honesty is backed by nothing more substantial than ignorance. Every two or three miles we dropped mail-bags bulging with the evidences of a popular parcel-post system, but since we were loaded for two hundred miles of such post-offices, the relief of the first twenty-eight miles was not material. We swung into Musquedoboit Harbour at noon with our wagons still top-heavy. That harbour is the first settlement of consequence east of Halifax, and promises in the future to attain some popularity as a summer resort for the weary Haligonian. Like all the coastal villages it is strung along the road for several miles, but it glories in two stores and a first class stopping-place. It is also exceedingly picturesque, with its deserted sawmill, its precipitously-banked river, and its fourteen miles of harbour. It also affords the lure of a mill-dam where speckled trout of four, or five pounds can be hauled out simply by jerking a bare hook up and down. “Jigging” may not be a sportsman’s recreation, but the fish gave no signs of it on the table. The sawmill was idle. Therein lies one of the tragedies of this ancient coast. 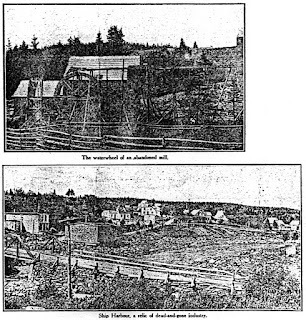 All along stand huge sawmills, representing many thousands of pounds of English capital, controlling many hundreds of thousands of acres of bush-land—the one at Musquedoboit alone possessed the rights to three hundred and fifty thousand— and almost all of them are silent and going to ruin. Except where the large timber is cleared out, it is the old story of overcapitalized enterprises, recklessly managed by men inexperienced in Canadian requirements, and suddenly dropped when profits failed to appear. 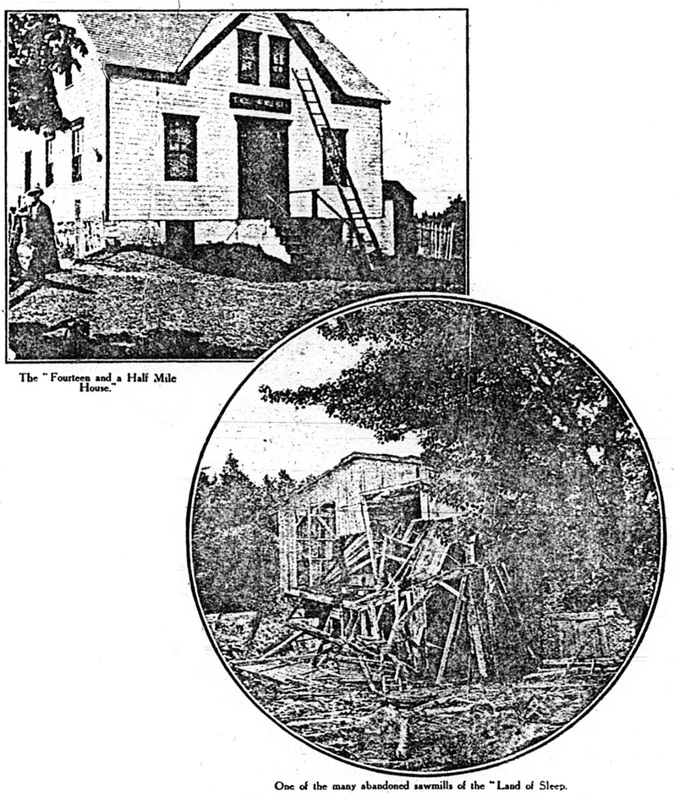 Sawmills were constructed at a cost many times what wisdom would warrant, expenses were incurred out of all reason, and British methods were forced upon a district that would not accommodate itself to them. 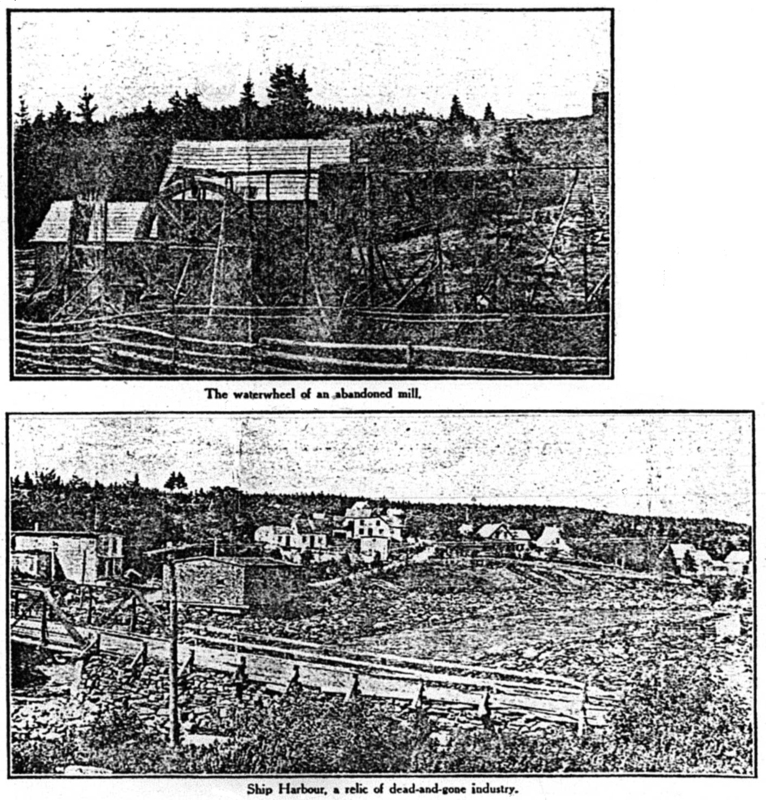 At Sheet Harbour, Ship Harbour, and many other points we came upon deserted buildings that had once given employment to hundreds of men, their rotting timbers now rattling idly in the wind. At Musquedoboit we bade farewell to the “coach.” Our plan was to tramp, stopping where we wished as long as pleased us, handing over to the coach the transportation of our baggage. We discovered that we had done better than we thought in avoiding the boats. The wharves were in every case miles from the stopping-places, and a horse could not have been hired for any price at more than one or two places. Horses, in fact, were a novelty, and even oxen were rare; road traffic of any sort was scarce. And it must be remembered that the road we were travelling was the only land trail within seventy-five miles. Northward, right to the north shore district of Nova Scotia, lay nothing but untracked forest where moose and bear abound—the best moose country in America. That road is a thing to marvel at. Throughout its entire length it is doubtful if one can find a straight quarter of a mile. 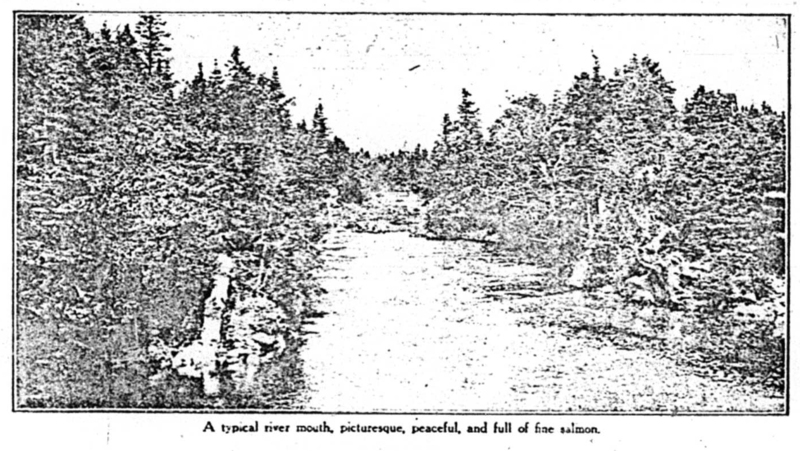 The south coast of Nova Scotia is a saw-toothed meeting of land and water, with sea-arms jutting in every half mile, often to the depth of fifteen miles or more; and, carelessly meandering along, with no apparent regard for anything but that the sea be somewhere within range, the road progresses, wandering over hills that might easily have been avoided with a saving of length and trouble, dipping into steep valleys that offer no excuse even for approach, jogging in and out along the shore, crossing sea-arms by means of embankments and short bridges, beneath which the tide rushes at times like a millrace. A village, therefore, but a few hundred yards away across the water may be five miles distant by the road. That is one of the reasons for the lack of appreciation of this one lone thoroughfare. During our tramp we walked for days without a sign of any vehicle but the coach, and in places the road was grown over with grass that showed only the marks of the tri-weekly passage of the mail. 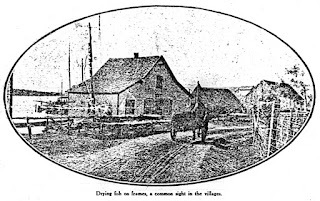 Reaching a settlement is so much more rapid by water, and there is so little need for horses among these fisher-folk, that the highway is a monopoly of the stage and the telephone wire that clings to it every mile of the way. In two hundred miles we met but six vehicles, apart from the stage. It was a bad road. A superlative adjective could not go too far. The favourite occupation of the Government seemed to be the employment of gangs of men every five or ten miles, whose duty it was temporarily to cover up the worst spots. In eight miles I counted twenty bridges and culverts gone, although in certain sections progress was under way towards the construction of permanent cement bridges. How the mail- driver manages to get along at all hours of the night would puzzle the uninitiated. He claims that the horses do it, but it would seem that Providence must have an extensive hand in the phenomenon. Limpid little streams flowed unimpeded across and down the roadway until the bed they cut for themselves almost blocked the way. We had but to stoop at scores of places to obtain a clear, cold drink. Boulders a foot high were met with frequently, and in one place, in the heart of an important settlement, the rocky way led us to imagine for a minute that we had wandered into a dry stream-bed. It was all very unconventional and natural—but not the best of walking, and hideous to ride over. Everybody complained; nobody used the road. Pretty nearly every family was drawing Government pay for pseudo repairs that left opportunity for more pay next year. 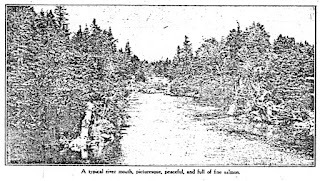 Setting out from Musquedoboit Harbour one afternoon on a short walk of eight miles to Jeddore Oyster-Ponds, the Woman-who-Worries and I fell immediately under the spell of the coast. In and out of the unbroken bush, flashing every now and then into full view of the ocean, with tiny villages breaking in unexpectedly and ex­tending themselves for miles under modifications of the same name, we passed along to the accompaniment of distant cowbells, tumbling water, dashing breakers, and sighing trees. We learned to listen for the cowbells, for they told of approaching settlements long before we burst on them suddenly from close forest. Every few miles a white church steeple peeped above the hills. It was the most “churchy” district in Canada, and every church a wonderful touch of quiet peace and simplicity in a rugged view. Whatever the builders may have omitted in the ways of expensive windows and architecture, they more than made up for by the selection of the sites. Mile after mile we would tramp, with not a sign of man’s handiwork in view save the half-hidden steeple of a church. We came to believe, when we knew the people better, that the outward form may have its influence. After a long, lonesome tramp we suddenly opened up an exquisite arm of the sea, with a little picnic under way on its shore—a dozen children and as many adults. It was a touch of life we were in a mood to appreciate. 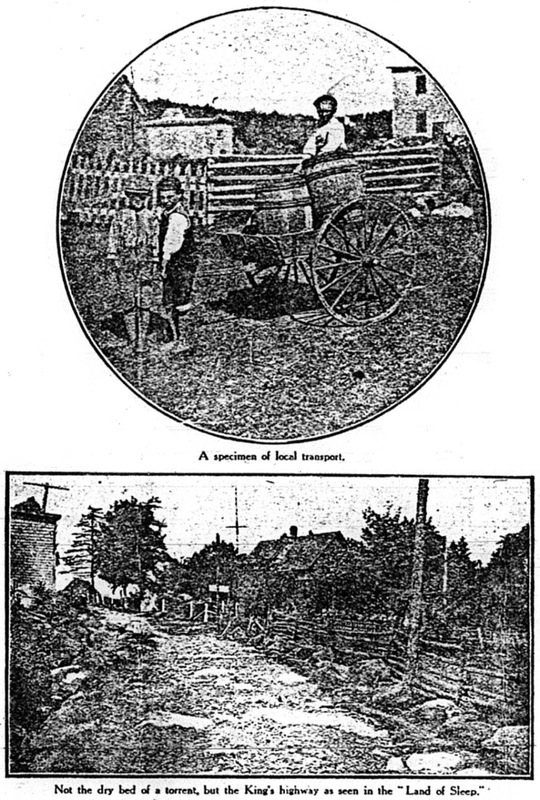 At Jeddore we experienced the first inconvenience of uncertain road-houses. In all Nova Scotia, save in the city of Halifax, there is no licence to sell liquor. Elsewhere the traveller suffers little from that in the way of accommodation, but along the south-east coast it left no excuse for an inn. 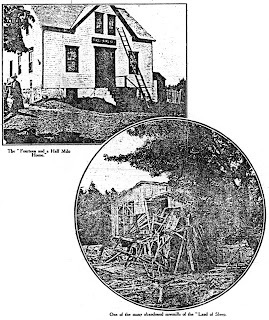 In the vicinity of Halifax there was no lack of roadhouses, But farther along the problem of finding a place whereat to sleep and eat became the nightmare of the trip. We had been told of a stopping-place at Jeddore, and there the coach had dropped our baggage, as directed. From the steps before a chilly-looking door it faced us when we arrived—as did a woman who stubbornly refused to take us in. Her obstinacy, we discovered later, was largely due to the occurrence of a wedding in the house the day before. With hearts filled with foreboding we plodded along, begging a bed. Finally, we got it. When we returned for our baggage the inhospitable woman informed us that she would not have seen us suffer for a place to sleep. 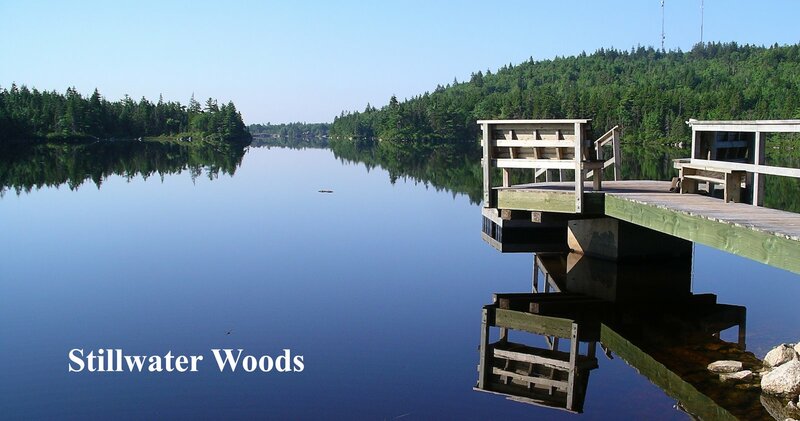 Jeddore Oyster-Ponds is one of the beauty-spots of the coast. But they are all picturesque. Each has its peculiar claims. The oyster-ponds are no more. 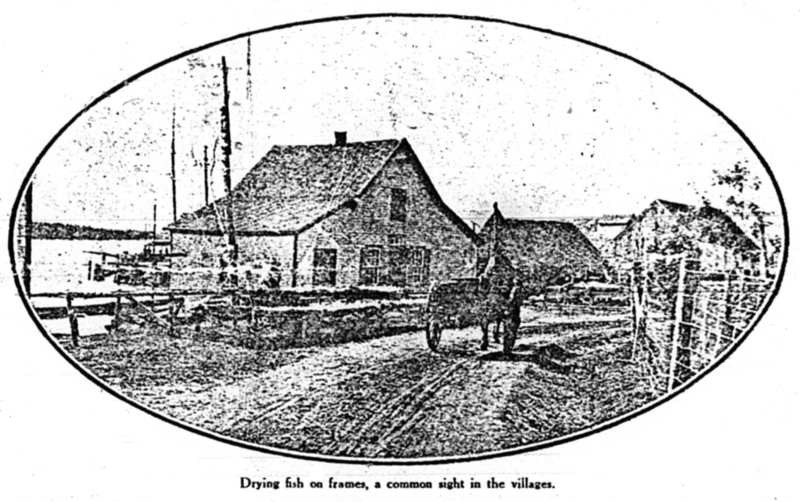 A sawmill came along, built a dam, and the oysters died from the sawdust and from lack of salt water. Their bleached shells still lie there as relics of an ancient industry. The following day another typical experience faced us. Starting out for Ship Harbour with instructions to stop at the four-mile point for dinner, we found ourselves at four miles (by my pedometer) a mile into the heart of the most desolate wilderness of bush and rock encountered along the entire route. We kept on, mile after mile, weak with hunger—for we had eaten no meat for a day and a half, and little else—until we began to fear that we had drifted into a trail through the interior. Shortly after two, as we were debating whether to turn back, a road-gang came into view, and, immediately beyond them, Ship Harbour. Instead of four miles for dinner we had come twelve. 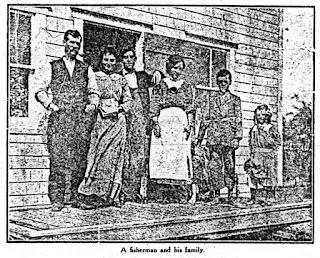 But the dinner we ate was worth travelling for: Breaking unexpectedly on a Mrs. Newsome, burdened with a husband stricken only the previous day with a paralytic stroke, we were served the best meal of our trip. The Mrs. Newsomes are too few in this world. Ship Harbour drowses on the memories of past glories. There is the wreck of a mill, the wreck of an imposing wharf, a wrecked dam. It still retains a reputation for its salmon-fishing, but little else except its stopping-place. It tops the end of a harbour that provides everything in the way of scenery. Setting out one morning down one side of the harbour we wound through four miles of an exquisite blending of water and bush and tree-crowned island. Out in the mirrored waters herring-boats were counting their spoil. Hanging on the fence was the horn used to call the ferry that would put us across the three-quarters of a mile of inlet at the coach-road. 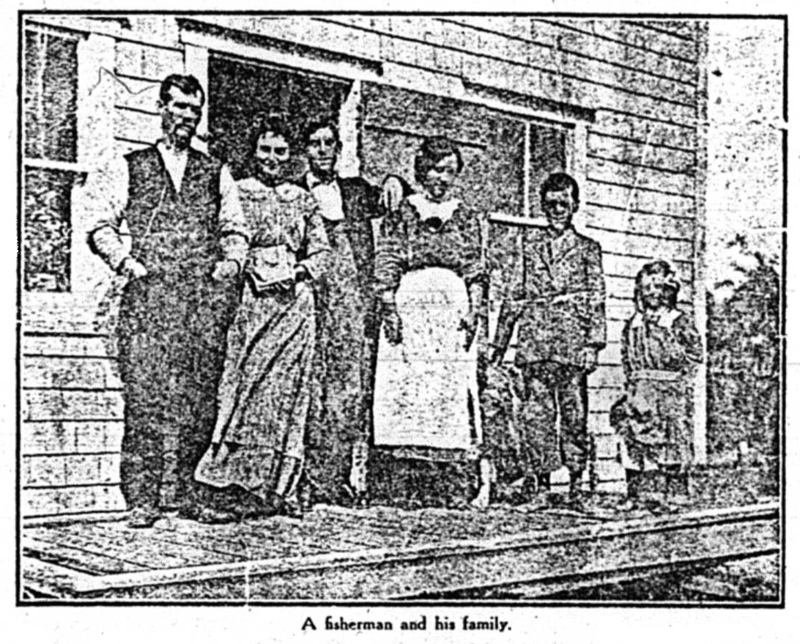 We had dinner at Tangier, where a couple of gold-mines introduce an unsightly element into the landscape, and supper at Spry Bay, in home-like surroundings that offered sufficient attraction for a visit of weeks. We had come twenty-three miles of rocky trudging since morning, but not a foot of it was uninteresting. But gradually the roughness of the wav began to tell. The new shoes of the Woman-who-Worries showed unmistakable signs of protest. Something must be done, or our walking expedition was over. There was not a shoemaker within fifty miles, and no shoes to buy. A fisherman drove in a few tacks. 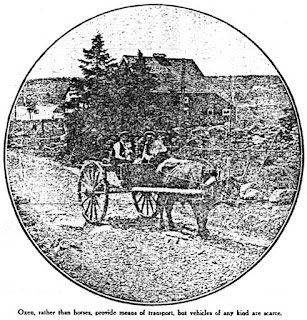 Ten miles farther we came to the largest settlement in the eighty miles from Halifax—Sheet Harbour. An imposing Catholic church stands aloft at the tip of the harbour, a huge, deserted sawmill beyond; there are three stores in the village, and two stopping-places. Surely there would be a cobbler. We learned of a citizen who worked in the mine by day and cut hair by night. He had been known to mend shoes as well. He mended ours. What was lacking in finish proved to be made up in staunchness of leather and multitude of tacks. We could understand why he worked all night on the job. From Sheet Harbour the country changes. Everything is wilder, more barren, more lonely, and with it the accommodation deteriorates. There might be a reason for travelling westward towards Halifax; there can be no excuse for facing the rising sun, for in that direction lie the outskirts of everything and, farther east, scores of miles of roadless coast. The highways became worse in spots than ever before, and sometimes better from sheer lack of usage. The bush was more dense and frequent, with here and there stretches of wild barrens that grew nothing but rocks and small spruce trees. At the end of one day’s walk we intended to spend the night at Harrigan’s Cove, but the disjointed, tumbledown settlement offered no inducement for better acquaintance. In a dense ocean fog, with the fog-horns from the coast lighthouses sending out their booming, dismal signals, we moved on in the gathering darkness into a country new to us, along a road that was difficult to follow even in daylight, the fog so thick we could scarcely see each other. It was only five miles, but it was a dripping, lonely, indefinite distance that might, in the way of locally-estimated distances, have spun out into eight or ten. But we got there, and our reward was the only modern bed we slept in along the coast. The following morning we came on one of the not unusual incidents of that stormy region—a schooner ashore. In the fog it had struck and was now lying on its side, with a chance of life should the waters stay quiet. The record of wrecks on that dangerous coast can never be written. It was a few miles away at Liscomb Harbour that only a few weeks before an ill-fated lightship had gone down with all on board. A new boat, on its way under its own steam from its builders in England to the Canadian Government, it had encountered one of the south-coast storms. 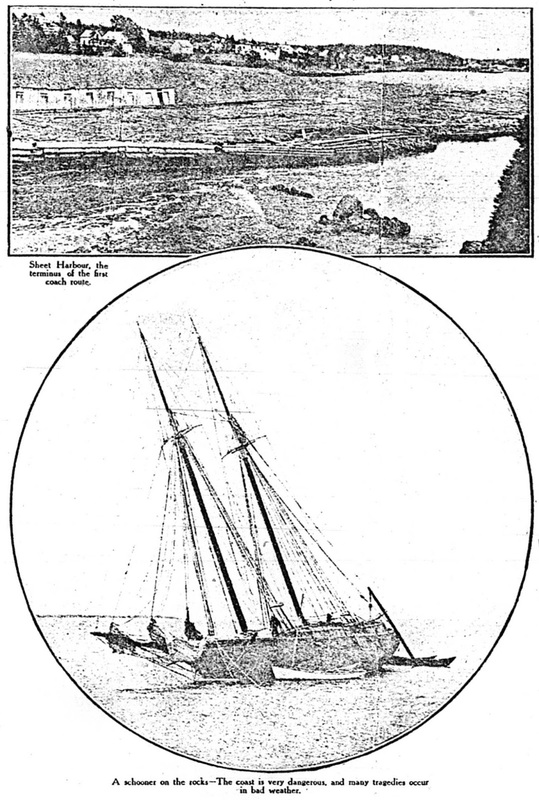 The wreckage was found off Liscomb, and a few bodies, and nothing more is known of the details of the disaster. Once a bear-cub stood in the middle of the road and stared at us, gambolling off into the forest at our approach. Through Ecumsecum and Necumteuch and their like we trudged in a cold, raw wind. It was six miles to Marie Joseph, we were told. Again and again it was “just along a little.” We found that it was close to thirteen miles, and when, by heedless directions, we were sent another two miles around a headland, we were prepared for our dinner by two o’clock. The life of Marie Joseph is one of strict simplicity and trust in Providence. Cod, herring, lobsters, swordfish, anything in the way of fish is the fisherman’s game, and most of the citizens were doing well enough without over-exertion. The setting-in of cold, wet weather here drove us to the “coach” again. Our first stage was one to remember. 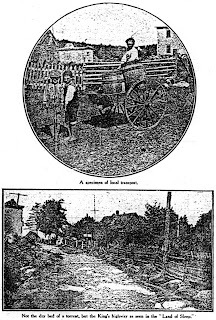 In the care of a driver who had suffered no apparent deprivation from the lack of licensed bars we dashed along a road that, for roughness, eclipsed the worst we had hitherto covered. Wildly up and down ungraded hills we swayed and surged, the horses lashed to greater effort in the middle of slopes that threatened to throw us on the animals’ backs. To protect ourselves from the flying lash we opened an umbrella; from the stones and ruts there was no protection within our control. A narrow shave of hitting a rock that, had we struck it, would have landed us in the adjacent barrens was acknowledged only by an oath. “This isn’t the life for me,” explained our Jehu; “I’m a sea-going man. If this road gets any worse I’m going back to it.” We were ready to regret just then that Nature had not hastened its operations. In half an hour, over such a road, we did five miles. Next time we decided we would sooner traverse it on hands and knees than trust that driver again. Twenty miles with another driver saw us at Sherbrooke, the largest village east of Halifax, beautifully situated in a deep valley beside the river of the same name. From there eastward the country is largely barrens. We preferred to strike the railway, away to the north, by a forty-two mile stage. That morning’s drive was over a road that would do credit to any country, both for condition and scenery. For miles it clings to a river, for miles more it skirts a lake nestling in the hills, and three miles of it is a continuous stiff climb to the brow of a hill where local tradition claims a daily rain all the year round. Eight of us were packed in a “rig” with two seats, the driver and myself clinging precariously to the dashboard for twenty miles. At that point lived the stage-owner—a most obvious provision for “milking” the traveller. The stage left Sherbrooke at 4 a.m., before breakfast was possible. At his home the driver changed horses, collected the fare, and invited us in to the most impossible, most expensive breakfast in southern Nova Scotia. It is a warning to the traveller to carry a biscuit. But even that breakfast could not spoil the pleasures of the seven hours’ ride. The eastern half of the south coast of Nova Scotia is not a tourists’ paradise. There is as yet no need for the accommodation the holiday-maker demands. The beds are not of the kind most people prefer, but the meals, as a rule, are surprisingly eatable. The difficulty of securing fresh meat is the most serious obstacle in the way of satisfying fare. There is little stock, and a “killing” is an event. At the outskirts of one settlement we came upon the last rites, and happened to mention it at the next roadhouse. The proprietor rushed away, and three hours later we ate a steak from the animal. It was, without doubt, “fresh” meat. There was a pretty uniform cleanliness and an evident desire to be hospitable and kindly. The scenery cannot be beaten, and the natural wildness of the country is especially attractive. Habitation confines itself closely to the water’s edge, for there is no industry but fishing, save for two or three gold-mines and a very few working sawmills. One confusing characteristic is the length of the villages, which necessitates inquiring for the house you want rather than for the village. Some settlements extend four or five miles, and the situation is further complicated by the adoption of a nomenclature that recognizes as essential certain qualifications, usually of location. For instance, there are in succession, Ship Harbour Lake, Ship Harbour, Lower Ship Harbour, and Lower Ship Harbour East, the whole covering by road a distance of more than twelve miles, with great stretches of intervening bush and water. It demands a minuteness of inquiry that is in itself confusing. In their unplastered houses the fisherfolk entertain the stranger with a kindliness that makes one eager to overlook the limitations of the accommodation. Dependent entirely on the run of fish, they accept everything with a resignation that is not always convincing, but is invariably becoming. Adversity finds them unprepared. The story of one fisherman is typical. Burnt out by a bush fire, he was unable to pay for the repair of his boat; and he would not borrow. So the boat was sold, and now he shares a herring-boat with a relative. He is still hopeful at sixty-five. Sickness claims its heavy toll among the helpless villagers. There are but a couple of doctors in as many hundred miles, their transportation being by motor-boat. A patient who can be moved is taken to the hospital at Halifax. An operation demands a surgeon from the same city, and is therefore usually prohibitive. Tuberculosis and cancer are dread scourges for which there is no local relief. My camera was a never-ending source of interest. I discovered that a photographer had passed along the coast a couple of years before, taking pictures of school groups and selling them to the eager children. Everywhere I was bombarded with requests, all the people offering to pay. One boy chased me for a mile—I could see him running far back on the road—with a request from his mother that I would return to take a picture of the family. “There’ve been two new babies since the last man was along,” he urged. A fisherman begged for a picture with the mournful reminder that he had a “fine family back there, and one never knows when something might happen one of them.” He won his point. The coast is dotted with evidences of better times. All along the way the grass-covered ruins of houses stand as mute testimony of the time when this coast was the best part of Canada. And added to them are newer houses by the score, their windows boarded up, their paint gone; and little stores that have long since ceased to traffic. So many of the younger generation have gone west, leaving the old homes to fall to ruin with the death of the old people. The little steamers plying along the coast fetch from Halifax almost everything the people think they need, and they and the parcel-post between them have sounded the death-knell of the local merchant. In two hundred miles there are not more than a dozen stores. At fall of dusk we came, at a lonely part of the road, on a tumbledown shack, with a ruined group of buildings about it. Many, many years ago it had been a fine residence, with its stables and outhouses. But now not a sign was to be seen that it was not deserted like the rest. As we looked, however, an old, bent man came tottering through a door with a broken hinge. He glanced at us with aimless wonder, gathered a few sticks in his thin hands, and tottered back. Through the curtainless window we could see him place the faggots in the stove, slowly, indifferently, and presently a puny smoke twined from the chimney. He leant down to the window to stare lifelessly at us once more, in his eyes the vagueness of the memories that are now his only possessions. It was an epitome of the atmosphere of the coast.